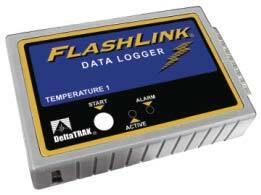 The DeltaTRAK FlashLink electronic data logger is one of the most economical electronic data loggers available. It includes a single internal temperature sensor. The FlashLink is easy to read, highly accurate and completely reusable. Output charts, graphs, spreadsheets or e-mail results anywhere in the world. Features a 3,822 data point capacity and quick download time. Many in-plant and travel uses. Software required - one time buy (not included). Certification: CE Mark by T.U.V. ; Calibration Traceable to N.I.S.T.